It’s no surprise Al Jazeera has received praise on its phenomenal coverage of the uprising in Egypt. What makes it so special is the fact that none of the other global networks have even come close to doing the same. While the reason that Al Jazeera has been able to provide world class coverage, unmatched by rivals such as CNN and Fox News, is debated by many, the Qatar-based news channel has released some interesting numbers for its portals online traffic influx. Kicking it off with a display of tech savvy coverage, Al Jazeera’s Internet & New Media team have been busy allocating alternative means to gather and distribute content in spite of the Egyptian regime’s brutal approach to containing coverage of the turmoil rocking it’s nation. Al Jazeera’s web output has proved incredibly popular in the last 24 hours. The livestream from their English news channel has been viewed for 26 million minutes in the last 12 hours. The livestream has even been twice as popular as the website itself, putting more pressure on US cable platforms in particular to air the channel. The effect of having such relentless coverage on the ground has pushed the Egyptian authorities to physically close Al Jazeera’s office in Cairo and forced Egypt based and privately owned satellite carrier Nilesat to terminate it’s signal according to Reuters. While the nature and detail of the coverage provided by the Al Jazeera English/Arabic team has been getting global headlines, offering free content under the Creative Commons license hasn’t exactly been an undesirable bi-product for the news industry. 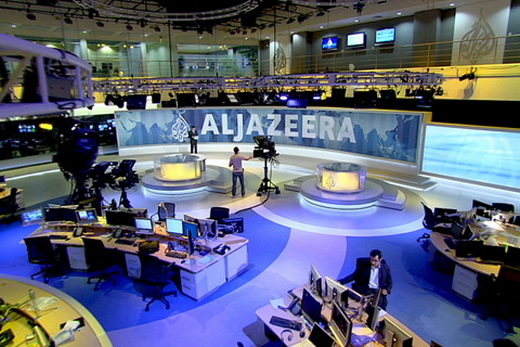 Al Jazeera Creative Commons first reported by ReadWriteWeb is providing professional on-the-ground images and video footage, and is available for free use so long as the user gives attribution and does not alter the products. Also tapping into the power of citizen journalism, Al Jazeera is providing a portal for bloggers and interested citizens in Egypt to upload footage and images through its online service Sharek (meaning participate). With one ISP left in operating in Egypt, it’s hard to say whether users will be able to upload content using it along with some unconventional methods. We’ll have to see how effective using alternate methods to cover the region’s second revolution will be, in a year that has proved to bare the title ‘Change’ even before its first month is over.